As you have likely experienced, today’s business decision-makers rarely turn to salespeople first when they need to make a purchase. They rely instead on the information, guides, and product comparisons they find online. Be honest; you’d rather research a need online instead of first talking to a person who is going to try and sell you their solution. There are some positive benefits to this new level of buyer independence (buyers are savvier and better-informed, so by the time they get to you, they are ready to have a high-level conversation about your product; buyers may find you online and give you a call—that’s a lead you didn’t have to work for!) But in general, salespeople must work harder than ever to compete in this new buyer climate. -Buyers form strong preferences and requirements in the early stages of realizing a need, defining the need, and researching options. If you are not involved in this discovery process, you will have zero chance to influence the buyer’s vision. -Forrester Research reports: vendors that are involved in the early phases of the buying process (1 through 3 in the graphic above) will get the deal 65% of the time. The problem is: many salespeople are powerless to get involved in the early stages, since buyers purposely exclude them. -By the time the buyer finds you online and contacts you, you’re reduced to a bidder. 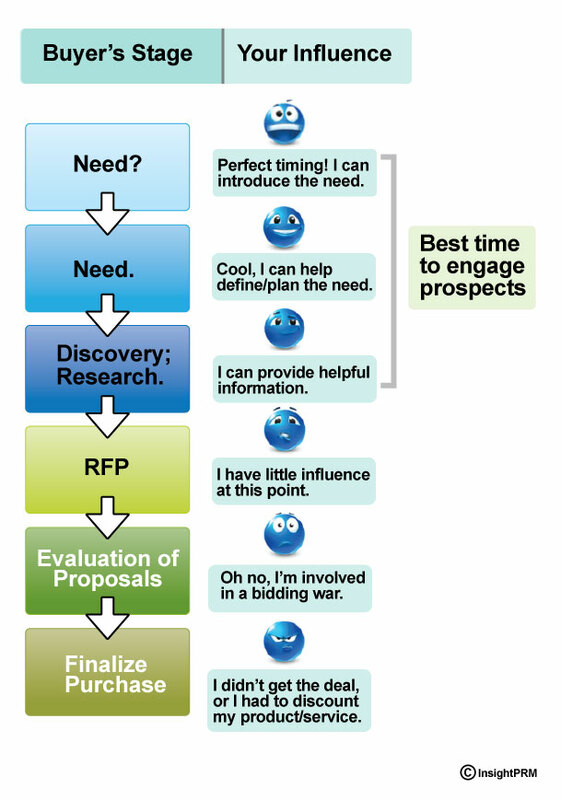 It’s too late to get in as a consultant, help the buyer write the RFP, and name your price. -Ask if there is a need. -Learn about innovations and new products in the industry they are buying in. -Introduce the need or confirm the need early on. -Help the prospect to develop priorities. -Create awareness of problems and challenges. -Establish your role as an expert and build trust. -Help the prospect to see the big picture; how does the purchase impact multiple areas of their business, over time? -Establish differences between you and your competitors.